With all the Arch Linux posts lately, loyal readers may be tempted to think I have given up the aggressive-investing game. Not true. I recently completed my trade of the year with those out-of-the-money GLD calls I wrote about back in August. I bought them for 25c a share, and sold them for various prices, a few as high as $8. All told, those calls netted something on the order of 800% return on premium paid. 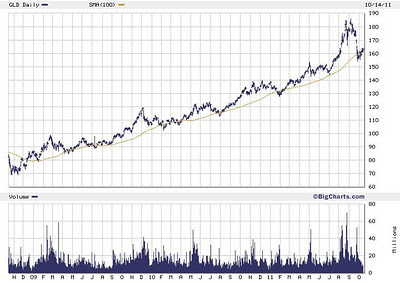 As I exited the last of those calls, GLD was in the midst of its toughest correction in the past few years. I bought my first shares of GLD in 2009, but even looking back as far as 2006, I don't see a correction as violent or as deep as the one we just completed. Gold bulls were hit with a triple whammy: a technical double-top formation around the end of August was followed by the Fed failing to signal much more in the way of monetary stimulus. As the investment world started its usual flight to quality in the face of disappointing developments, the CME responded to the increasing volatility in gold futures by raising the margin requirements. Everyone in the trading community still remembers how margin increases sparked the recent Silver panic, and so it is no surprise that GLD gapped-down two days in a row in the last week of September. It shed 8% of its value in two trading days, which is a pretty dizzying fall for a physical commodity unaffected by droughts and floods like gold. The gold haters came out in droves, claiming this was the "popping of the bubble", and giving target prices of $700/oz (about $70/share in GLD terms). I stepped away from leverage on GLD, which I had planned to do during the fall, anyway, since September-October has historically been a bad season for gold (I have no idea why, it's not like there's a harvest or something). I gritted my teeth and held onto my outright shares of GLD, the straight-up gold ETF, and GDX, the ETF comprised of gold-mining companies. And I bought a few more shares of GLD on the way down, but far too soon (169). I admit I started worrying that the bubble was popping, too, but those fears are past. Does the chart above look like a bubble to you? I have added a 100-day simple moving average to the price of GLD over the past 3 years. Notice the double-top, with a high of 185, and the two days of down-gapping shortly afterward. But also notice that GLD stopped its free-fall at the 100-day trendline, and resumed the trend. That's not a bubble-pop, that's the start of the mania phase. 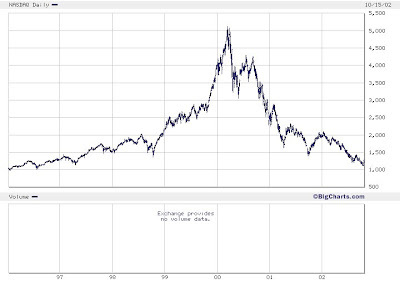 Here's another chart you might recognize, this time of the NASDAQ from 1996 through 2002. See how there are corrections back to the trendline throughout the 1990s? Some of them undoubtedly looked like The End at the time, but those corrections ended up looking like little squiggles in comparison to the mania phase starting in late 1999, and of course the multi-year sell-off afterward. So I'm looking to buy dips in gold again, since I think we'll start another leg up in this market sometime around year-end. I've already bought some shares in GDXJ, an ETF comprised of smaller-cap mining companies, and some calls in GDX, expiring in January. Both are already priced higher than where I bought them, but I can't take credit for that -- it was just an effect of the risk-on-risk-off hokey-pokey the markets have been dancing since 2008. At the moment, we're putting a foot in, so all risky assets are going up. Later, we'll take it out, and they'll all fall again. Why mining companies instead of gold itself? I mostly prefer to trade the metal on its own, so as to slightly reduce the vast number of variables acting on my investment, but we are entering Q3 earnings-reporting season. There will be a lot of bad news coming out of the tech industry (Google's blow-out notwithstanding), and a lot of good news coming out of the mining industry, as gold miners realize higher and higher prices for the more or less constant rate of supply they are pulling out of the ground. Also, mining companies have lagged behind gold prices during this bull market. If they close the gap, I'd like to be there to profit from it. And finally, dividends. Gold doesn't pay a dividend, but miners do. Consequently, I might look to buy a few outright shares of individual mining companies so as not to dilute my dividends through the GDX ETF. I have some trades unrelated to gold in progress, too, but that's another post.